When used to describe the availability of any system, Five Nines means 99.999%, which is equivalent to no more than about 5 minutes’ worth of unplanned or planned downtime in a rolling 12-month period. A system with Four Nines availability (99.99%) has no more than about 53 minutes’ downtime over the same period, so Five Nines is about 47 minutes a year better. High-availability services (with Five Nines) typically have the following attributes. In terms of infrastructure, this means for example that service continuity does not depend on any single site, platform, device or connection. In terms of people – in the case for example of managed IT services – there is no dependence on any individual at any time. This means that service is delivered from different places. For example, using data centres located (as a rule of thumb) at least 30 miles (or 50km) apart and providing local access from different telephone exchange buildings, each connected to geographically-diverse core network nodes. Use of core connectivity provided by different network operators protects against an outage (fault, planned maintenance) in any single operator’s network. Local connectivity provided by different operators or using the same operator’s resilience product avoids disruption arising from any single fault with an operator’s line plant – cabinets or masts, ducts, cables etc. Five Nines reliability is designed into any reputable service, but what is outside of the control of the service provider is any local connectivity between the service and its users on the corporate network or whilst roaming. Any purchaser of services needs therefore to strike a balance between service performance (user experience, availability) and purchasing cost. The operational importance of any applications running over-connectivity is a decisive factor. For example, if email access is interrupted it’s a nuisance, but if (say) hosted telephony in a contact centre goes down, it is extremely disruptive and frustrating for the affected organisation’s users, customers or constituents. Matching connectivity to the applications it carries is, therefore, an important risk-based decision. Consider for example the various types of fixed-line connectivity that we provide and their respective monthly availability service levels as set out in Table 3‑1 below. The key difference between a Four Nines service (Fibre Ethernet with copper-based backup) and the highest-availability services is that the latter use dual fibres. In the UK market, at least for now, fibre is priced at a premium over copper, so to get from Four Nines to Five Nines using fixed-line connectivity, the additional cost of the spare fibre is unavoidable. One alternative is to take the Four Nines service and put in place a business continuity plan which factors in the reduced service performance available when there is an incident with the fibre. Another alternative is to use our 4G Direct Internet Access (4G DIA) as a back-up, providing a fast mobile data connection (subject to the quality of mobile coverage at the served site). Our network has no single point of failure, is geographically diverse and is resilient, as illustrated in Figure 4‑1 below. In the UK, the main hub of the Internet is Telehouse North (THN) which is the primary home of The London Internet Exchange connecting over 850 autonomous systems from over 80 countries. Our network includes connectivity between this site and our new data centre in Birmingham. 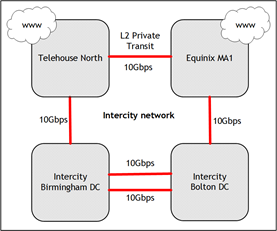 In addition, our Bolton data centre is connected to Equinix MA1 in Manchester, which is the most important network node outside of London, providing geographic resilience which is not dependent on London Docklands. A layer 2 private transit connection also connects between THN and MA1. Our data centres are built to Tier 3 specification, each supporting 99.98% uptime, a target which has never been breached, with no outages in the last 3 years. We deliver services using connectivity from a number of different carriers and this includes the external connectivity and interconnects used within our network. Our Birmingham data centre is served by fibre from a Tier 1 carrier, whilst at Bolton our connectivity partner is a different Tier 1 carrier. This multi-carrier approach, using separate networks, guards against an incident affecting any single carrier. Our network is configured to fail-over automatically via its internal interconnects, provided by three different Tier 1 carriers, each with their own network. Our Touch portfolio of cloud services, providing telephony, computing and firewall are delivered from dual platforms hosted in Birmingham and Bolton. For example, a customer’s firewall (Touch Secure) service can be delivered primarily from Birmingham, with Bolton on standby or vice versa. This means there is no reliance on a single data centre for continuous security service availability. We monitor our service delivery platforms and network connectivity from our Intercity Secure Operations Centre (ISOC) which is based in the same buildings as our data centres and manned round the clock. The ISOC also provides our managed IT services, maintaining, monitoring and managing our customers’ networks, providing a managed service desk and remote support. You are best placed to understand the importance of any applications used within your organisation and the financial impact of any service interruption. We can help by advising on the various means of service delivery and setting realistic expectations about their respective availabilities. You are then best placed to decide on the number of nines you need. The post The Road to Five Nines appeared first on Intercity Technology. How do signature-based attacks work?